Co-ordinator: Bernadette Barrett, 5, Tyrone Avenue, Lismore Lawn, Waterford. Irish Republic. E-mail barrettb@gofree.indigo.ie +353 (0) 51-373876. Photograph courtesy of Mr N. O’Donoghue, KSPCA. happen to arrive on the scene. See page 5 for her story. No reprieve for the badger. The killing goes on. Page 2. To ask the Minister for Agriculture, Food and the Marine the current badger population in Ireland; and if he can provide independent peer reviewed evidence that supports badger culling as a proven successful strategy in the eradication of bovine TB. - Maureen O'Sullivan T.D. (Ind) Dublin South Central. 9th February, 2012. There are no accurate statistics available on the current badger population in Ireland. However, based on the results of the Four Area project, the best estimate available to my Department is that there are approximately 80,000 to 90,000 badgers in the country. There is considerable peer reviewed research showing that the removal of badgers results in a reduction in the incidence of the disease in cattle. In Ireland, the first major research project took place in East Offaly between 1989 and 1995. This study demonstrated that, following the removal of badgers, the risk of herd breakdowns in the removal area was significantly reduced, the risk of a TB breakdown in a herd being 14 times higher in the control area compared with the removal area. The next significant study, known as the Four Area Project, was conducted from 1997 to 2002 in four different areas of the country. This project demonstrated that the total number of herd restrictions in the removal areas during the study period was almost 60% lower than in the pre study period. 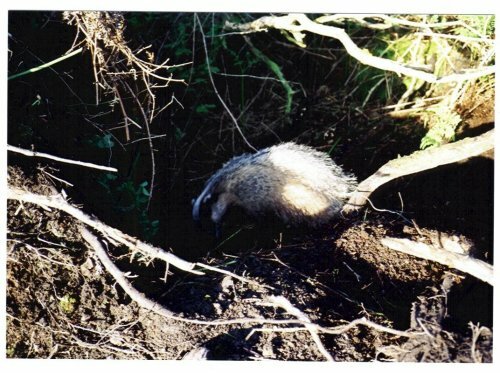 A further study showed that targeted badger removal in County Laois between 1989 and 2005 had a significant beneficial impact on the risk of future breakdowns. The UK has also conducted significant research into the role of badgers in the spread of TB and the impact of the removal of badgers on the incidence of TB in cattle. The most recent research was conducted by the Independent Scientific Group, which directed the Randomised Badger Culling Trial (RCBT). The initial findings of the trial showed a 19% reduction in the incidence of TB in cattle in the removal areas but a 29% increase in the areas surrounding the removal area. However, the effects of the cull continued to be monitored after the cessation of culling and a recent report by DEFRA concluded that, overall, from the beginning of the cull, there was a 28% reduction in TB confirmed cattle herd incidence in the culled areas when compared with the survey-only areas. In addition, confirmed TB herd incidence on the land 2 km outside the culling area was comparable with that in the survey-only areas. I am satisfied that the badger culling strategy, which is an important element of my Department’s Bovine TB eradication programme, has contributed to a significant reduction in the incidence of bovine tuberculosis here. Since 2000, the number of reactors has declined from 40,000 to 18,500, the lowest recorded since the commencement of the eradication programme in the 1950’s. It is interesting to note that the incidence of TB in Great Britain, which does not implement a badger removal programme, has increased substantially from 6,000 reactors in 1999 to 33,000 in 2010. I understand, however, that DEFRA intends to implement a pilot badger cull in the autumn. My Department intends over the coming years to gradually replace badger culling with badger vaccination and, with this in mind, we have been funding research in UCD and collaborating with DEFRA in the UK on research into a vaccine to control tuberculosis in badgers. Research to date has demonstrated that oral vaccination of badgers in a captive environment with the BCG vaccine generates high levels of protective immunity against challenge with bovine TB. However, field trials are also being undertaken to assess the impact of the vaccine on the incidence of disease in field conditions. If these trials are successful, badger vaccination will be incorporated into the eradication programme. However, it will be some years before the trials are completed and therefore targeted badger removals will continue in the medium term. The picture on previous page is one the Department of Agriculture do not want you to see. In recent years, Agriculture prefers to use the description ‘specially devised stopped body restraint’ (a comfy harness) as approved under the 1976 Wildlife Act (amended 2000). Nothing could be further from the truth. The killing continues without mercy and thousands of our ‘legally protected’ badgers have met and will continue to meet their fate in these cruel multi-strand wire snares. The Irish Government insists it’s done in the name of scientific research. In one period alone from 2000 – 2011, close on 65,000 badgers have died in the name of ‘science’. It is nothing more than a blatant extermination of the animal. Non-targeted species, foxes and dogs also fall prey to it because the snare is indiscriminate. Badgers injure themselves in the struggle to escape. The picture at bottom of page shows a badger (snare on hind quarters) attempting to dig its way to freedom. While the animal struggles, the snare tightens, almost strangling the badger. Badgerwatch has seen the results and it’s a heartbreaking sight. 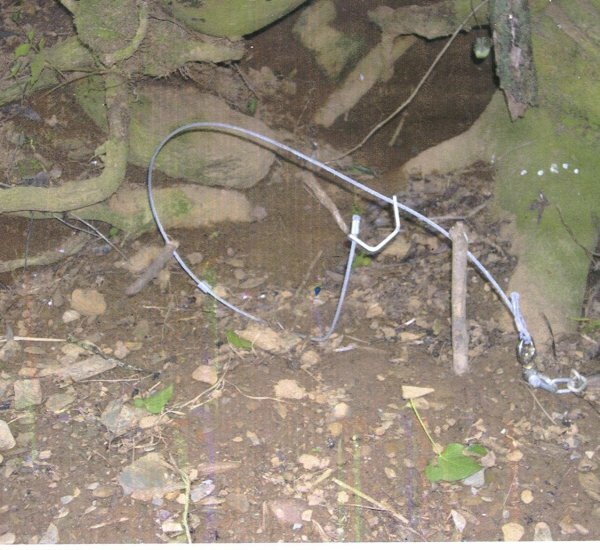 Recently, Badgerwatch has been contacted about further incidents from different parts of the country where badgers, already caught in snares had succeed in pulling the metal stake out of the ground. The animals have been seen struggling about fields dragging metal stake in tow until help from concerned individuals intervenes. Far from been the humane restraint described by Agriculture, the snare can be regarded as our own weapon of mass destruction and looks set to remain the scourge of our countryside for years to come. KILKENNY SPCA WELFARE OFFICER, NOEL AND HELPER PLACING HER INTO A CARRIER FOR VETERINARY TREATMENT. Thousands of our badgers die annually on our roads. A fleeting glimpse of the dead animal lying in the ditch is about as close as the public may ever get to seeing the animal. Coming upon such road casualties and they are many is bad news to lovers of the animal. But, an additional and more serious tragedy may also occur where the victim is female and lactating. The chances of rescuing her dependent cubs is almost impossible. Thankfully, on this occasion she was not a lactating sow. The call had come early am. 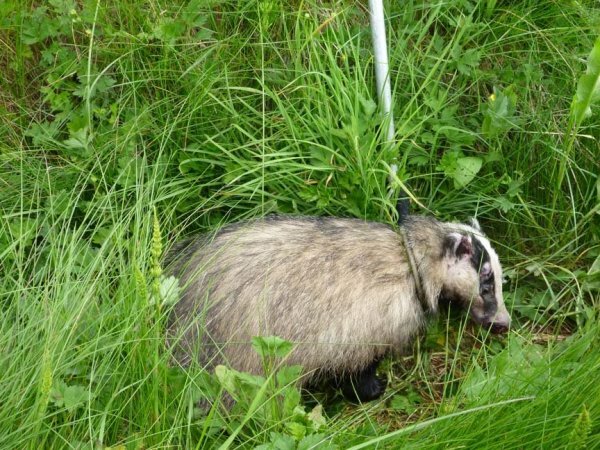 The caller identified himself and reported the injured badger lying on the motorway, somewhere in the vicinity of the Carlow exit. This is one of the big problems nowadays – getting an exact location on a motorway. It was, at best, an hour’s journey from Waterford. Help came from Noel, who was about twenty minutes from the spot. 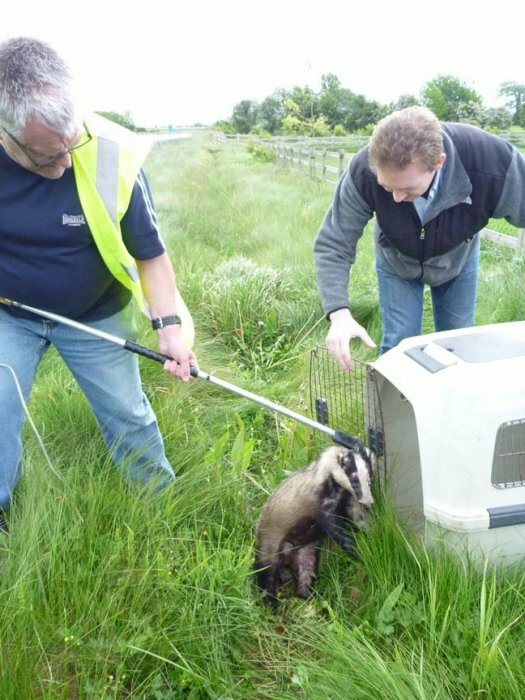 The picture shows both men lifting the injured badger into the carrier and then taking her to the nearest vet for examination. During all of this time, her helper remained at the scene and assisted Noel. Much credit is due to this man for his compassion and concern for the animal. Thankfully, she made a full recovery from her injuries after a brief stay at the vets where she received the necessary medical attention. In due course she was released back to the wild by Noel and the local Conservation Ranger. We hope she is now enjoying her new lease of life in her selected and safer surroundings. THE ULSTER Society for the Prevention of Cruelty to Animals (USPCA) has urged the public to be vigilant against badger-baiting after a man was arrested and a badly injured dog rescued near Banbridge, Co Down. David Wilson of the USPCA said the severe facial injuries to the dog, a Patterdale terrier, were consistent with the animal having been involved in a fight with a badger. The man (58) was arrested by PSNI officers co-operating with USPCA inspectors on Wednesday night. It was part of a UK-wide crackdown on badger baiting called Operation Meles. The terrier was rescued from a house in Gilford near Banbridge. A vehicle was also seized. The man was released yesterday “pending further inquiries”. In follow-up searches on nearby premises yesterday morning, four similar terrier-type dogs were recovered and taken into the care of the USPCA. Several implements, such as long-handle spades suitable for digging up badger setts and boxes to hold badgers, were also seized. Badger-baiting involves setting dogs against badgers. It often involves betting, while breeding and selling the terriers is also a business. Mr Wilson said the seizures in Co Down were part of an intelligence-led operation. Throughout the island, he added, it was estimated that badger baiting was “costing the lives of thousands of Irish badgers” each year. He said those involved did not go near the badgers in the summer when they were breeding but that this was the season for digging them out of setts to prepare them for organised badger-baiting at “very secret venues”. There was particular suspicious activity to look out for. “You are looking for a van or a vehicle with trailers; you are looking for dogs; you are looking for guys carrying long-handled spades.” Mr Wilson asked for people, particularly farmers and others living in rural areas, to be watchful for people who might be involved in “this medieval pastime”. The U.K.Government has announced the two areas where it will be piloting its Badger Control policy in 2012. Many of you will already be aware that an announcement has now been made regarding the broad location of the areas in which the pilot trials will be held. The Badger Trust is keen to gather as much information as it can about the areas and the progress of culling if and when it begins. However, please bear in mind the Badger Trust's policy of taking particular care not to trespass or undertake any other activity which could be regarded as illegal. These trials are designed to test the efficacy, humaneness and safety of the controlled (free shooting) of badgers. If the trials proceed, shooting will commence in the autumn and will continue for six weeks. As badgers are nocturnal the killing will take place at night, and will be carried out by trained marksmen using high-powered rifles. Their remit will be to kill at least 70% of the badgers in each of the trial areas. The killing will be non-selective, but the majority of those killed will be healthy. Of the small percentage of badgers which may be carrying bovine TB, very few will be infectious and therefore capable of transmitting the disease. Each of the trial areas must be at least 150 sq.km., that is c. 8 miles by 8 miles, but could be larger. At least 70% of the land in the area must be covered. The precise areas and boundaries where the shooting will take place will not be revealed but are stated to be in WEST GLOUCESTERSHIRE and WEST SOMERSET. Licence applications from groups of landowners who propose to cull badgers will be considered by Natural England. At the same time, interested parties living within and immediately adjacent to the proposed licence areas are invited to comment in order to draw Natural England's attention to any material impacts that may be relevant to their determination of the licence applications. If you live in or immediately adjacent to either WEST GLOUCESTERSHIRE or WEST SOMERSET please ensure you respond within the stated timescale. If you live outside those areas but know of people who are entitled to respond, please forward this message to them. The shooting of badgers will affect everybody living and working in, or adjacent to, the two pilot trial areas. They are both popular destinations for tourists who may decide they do not want to visit areas where badgers are being shot at night. Businesses in the area, e.g. those offering accommodation or food, may see a drop in their income. Do not make the mistake of thinking that because you live in a town or village, this will not affect you - if you run a business, your business may suffer and you should take the opportunity to draw Natural England's attention to this. Others who live in rural areas perhaps offering accommodation with badger watching as an attraction also need to consider the impact on their income. The "Opportunity to Comment" is not a consultation - the decision to trial the shooting of badgers has been taken - this is purely and simply an opportunity for you to state the impact it will have upon you, your home, land and business. If you visit our website www.badgertrust.org.uk you will find much information together with press releases which we hope will prove helpful. Badger Trust is a single species charity, dedicated to the conservation, welfare and protection of badgers, their setts and habitats. We need your help to do so as we are committed to fulfilling our aims in any legal way open to us. If you would like to become a supporter of either Badger Trust itself, or one of our local badger groups or assist us in any other way, details can be found on our website. Thank you in anticipation of your help. Badger Trust is the only charity dedicated to the conservation of badgers throughout England, Wales and all Ireland. Badgerwatch. 5, Tyrone Avenue, Waterford.. Ireland. 051-373876. Subscription: 7E Individual …….. 15E Family…….. Donation optional…….